This tutorial explains how to install letsencrypt SSL certificate for Apache web server on CentOS 7. Let's Encrypt is a certificate authority that provides SSL/TLS certificates for free. 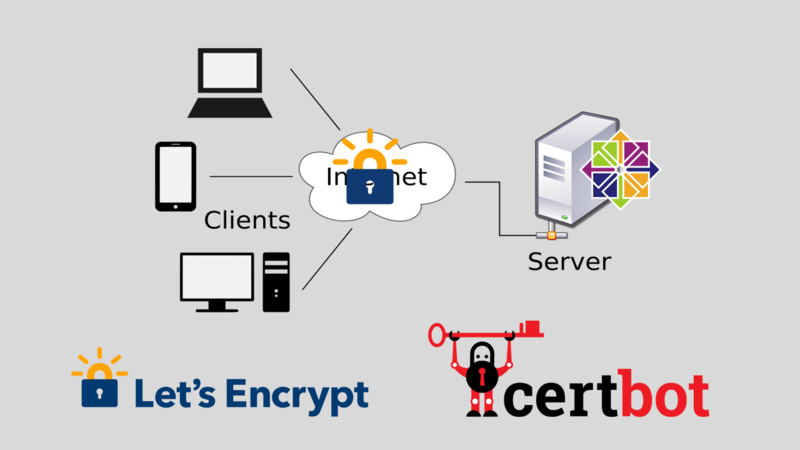 Let’s Encrypt provides trusted certificate through an automated process, without any cost. To install Let’s Encrypt certificate you need to have shell access to the CentOS system with administrative privileges. During the process, a new virtual host configuration for the https site will be created automatically based on the this configuration. If you can't point your website to the server before installing the certificate, You can use DNS-01 validation method to prove the ownership of the domain name. Verify the virtual host file. As the final step, You will be asked to choose whether or not to redirect HTTP traffic to HTTPS. You should not redirect HTTP traffic to HTTPS at this point. So answer with 1 for No redirect. And that is all we need to do to install Let’s Encrypt certificate on CentOS 7. Issued certificates are valid for 90 days. You can run certbot renew command to renew all certificates on your CentOS 7 server. This sets the cron job to execute the certbot renew command every 12 hours and will renew all obtained certificates that are near expiry. Note that your SSL certificate, private key, account credentials and everything else are saved in your Certbot configuration directory at /etc/letsencrypt. Make Sure to keep regular backups of this folder.